As fate would have it two dear and very stylish friends decided to blog about my fabrics at the same time. Charlotte Moss did a wonderful post on her name sake fabric “Charlotte” for her Tete a Tete blog. I am so excited that she loves the fabric so much she made a smashing coat out of it! While last weekend James Andrew of What’s James Wearing came for lunch in the garden with his partner Scott McBee. It was a wonderful relaxing afternoon. I am really looking forward to them coming back this fall for a weekend of fun country activities! Check out their fun posts here. Charlotte wearing Charlotte in Absinthe on Tete a Tete. 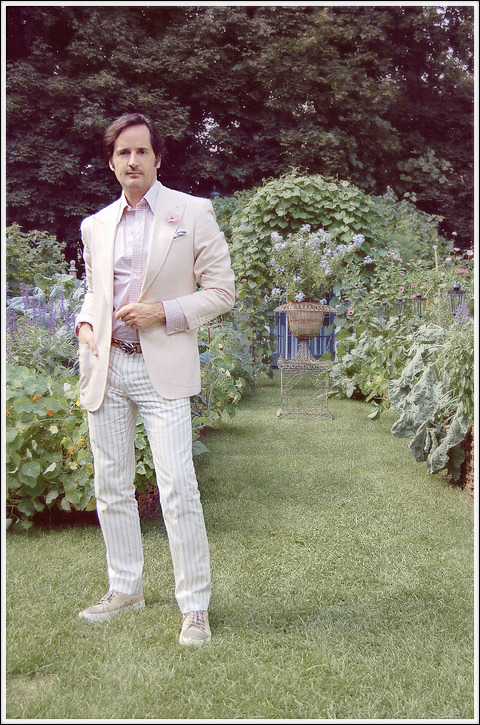 Dapper as always, James in the garden. Image from What’s James Wearing.